Action from Bedford Athletic Warriors v Ampthill Extras. Bedford Athletic contrived to lose 17-10 on Saturday having led at half time in a close National 3 Midlands encounter at Derby. Early penalties went against Bedford to the extent that Derby had an early shot at goal which George Castledine missed, leaving the visitors none the worse for a slow start. It wasn’t until Andy Ince broke through the home defence that the visitors became able to exert any authority. A line out in the home 22 saw Tommy Mills able to burst through onto the ball and he created the extra man that saw Stuart Livesey home to score the first try on 16 minutes. Both sides continued to be evenly matched and with their respective lineouts malfunctioning chances grew and Athletic were next to profit when a stolen lineout saw Mills again adding the extra man to allow Josh Cassell to retrieve David Simpson’s kick through for an unconverted score. Derby put pressure on a visiting scrum and having turned that to their advantage they then powered over for the try awarded to No.8 Tommy Taylor-Dawes. A good start to the second half was imperative for the visitors and this was nearly achieved. Nick Thomas charged upfield to find Jake Foster in support and he was agonisingly held up over the line. 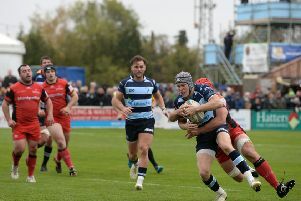 Bizarrely Bedford then began to chase the game despite leading and with the added pressure of deploying a running game when a game based on kicking for territory would have sufficed, errors were bound to come. On the hour mark, Athletic were caught short of numbers in midfield and when the ball was turned over, it was a simple task for Derby to attack with Ben Marlowe able to finish off the scoring chance. The final 20 minutes were a frenetic affair and this did not help Athletic as they were not able to impose a kicking game to dominate territory, nor a possession game to control the pace of the game. Eventually Derby turned the ball over once more and this time Josh Tilford was on the end of the scoring opportunity, the unconverted try giving Derby a 17-10 lead. Trailing safety nine points, Athletic entertain Lichfield this Saturday where a victory is vital to launch a successful escape from relegation.